Rusty opened his first Signs by Tomorrow in 1995 in Alexandria, VA and opened his second location in Herndon, VA in 1997. In 2002 he sold Alexandria and moved his Herndon center to Dulles, VA in Loudoun County where his business has resided since. Rusty has won numerous awards from the franchisor and leads a training class for all new franchise members. 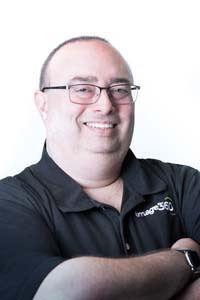 In January of 2017 he converted the center to Image360, a brand that will allow the company to expand its already vast array of products and services. 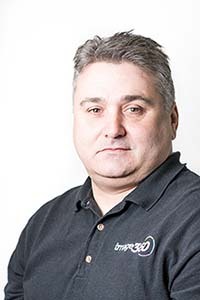 Patrick has been with Image 360 Dulles/SBT since 1999. He is involved in every aspect of the business and manages some of the company’s largest customers. Michelle joined Image360 in 2010 as a CSR. In 2014 she was promoted to Front End Manager and in 2017 she was promoted to Store Manager. 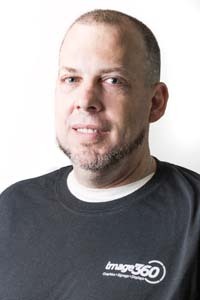 Brandon began at SBT/Image360 in 2009 and has been in the signs and graphics industry since 2006. He is skilled in production, installation, and graphic design. Dannica started with Image360 in 2017. She is usually the first person clients speak with, when they call. 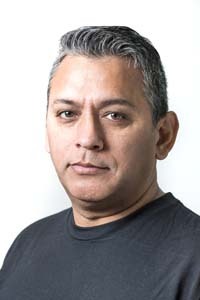 Pablo started with Image360 in 2018. He is a recent graduate of NOVA where he received a degree in Graphic Design. 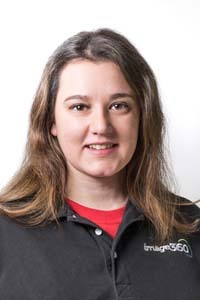 Lauren started with Image360 in 2018. She is a recent graduate of Norfolk State University where she received a degree in Fine Arts and Graphic Design.